Khalid Ali El-Maaytah,MD٭. Bashar Reyad EL-Momani PDS٭٭. Nidal M. EL-Soud, MD٭٭٭, Alaa Saleem Jumean, MD٭ .Mohammed Nayef AL-Bdour, M.D٭. Objective: Cleft lip is a common congenital anomaly in our population. It imposes serious psychological and social disturbances in both children and their families. Centralization of cleft lip care led to the great evolution of pre surgical orthodontist management and the continuous rejuvenation in surgical techniques, hence primary cleft lip repair with primary rhinoplasty has become the keystone of successful management. 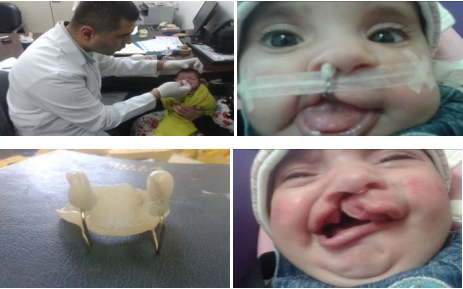 In this study we present our experience and current practice at the Royal Jordanian Rehabilitation center which were based on successful centralization of cleft lip care with strict commitment to rules of modern cleft multidisciplinary care. Methods: This is a retrospective study of 100 patients with cleft lip/palate who were classified and surgically treated in our cleft unit from January of 2014 to January of 2018. Pre surgical orthopedics (nasoalveolar molding – NAM- and taping) were applied in 98% of the cases. Surgical technique included both Chang Gung cleft lip nasal repair (variant of rotation advancement techniques) and the Anatomic subunit approximation repair (variant of geometric repairs). Both Tajima semi open rhinoplasty and McComb techniques were utilized in primary nasal repair. All surgeries were performed under general endotracheal anesthesia on inpatient basis. All minor revisions for secondary deformities were performed on outpatient basis. Average follow up period is 2 years. Results:The geographic distribution of deformity was highest in the north of Jordan followed by the middle and south (48%:44%:8% respectively).The age of the patients at the time of operation ranged between 3 And 6 months (mean age was 3.5 months). Male to female ratio was 72%:28%, ratio of cleft lip:cleft lip/palate (CL:CLP) was 52%:48%, ratio of unilateral to bilateral deformity was 80%:20%, ratio of complete to incomplete deformity was 56%:44%. In unilateral cases ratio of left to right deformity was 65%:35%. The average weight at time of surgery was 5.1 Kg. The most common associated congenital deformity was congenital heart disease (most common was atrial septal defects) in 25% of cases. Associated craniofacial deformities included: hypertelorism in two cases, binder syndrome in two cases, Van der Woude syndrome in one case, type 4 craniofacial cleft in one case and microtia in one case. 8% of cases had positive family history of cleft. Mean operative time was 120 minutes and mean hospitalization period was 36 hours. Morbidity consisted of 3 cases with stich sinuses and minor dehiscence and two cases of pneumonia. There was no mortality. The most common secondary deformities were vertical nostril collapse in 23% of the patients, hypertrophic scarring in 10% of the patients, excess vermillion deformity in 5%, wide prolabium in 2% and vermilion border mismatch in 2%. Conclusion: Centralization of cleft lip care with multidisciplinary and inter disciplinary decisions between cleft team members led to the dramatic improvement in total care. Achieving near normalcy in the shape and function of the cleft patients is the definitive goal with decreasing the number and complexity of subsequent procedures. Cleft lip is a common congenital anomaly in our population. (1) It imposes serious psychological and social disturbances in both children and their families. With the great evolution of pre surgical orthodontist management and the continuous rejuvenation in surgical techniques, primary cleft lip repair with primary rhinoplasty has become the keystone of successful management. To achieve the definitive goals of cleft care (normal speech, near normal cosmetic appearance and occlusion), strict adherence to the modern cleft, interdisciplinary and multidisciplinary care must be set as role model. 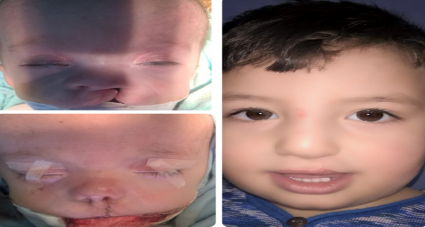 (2)In this study we present our experience and current practice at the Royal Jordanian Rehabilitation center which are based on successful centralization of cleft lip care with strict commitment to the rules of modern cleft multidisciplinary care. This is a retrospective study of 100 patients with cleft lip/palate who were classified and surgically treated in our cleft unit from January of 2014 to January of 2018. Pre surgical orthopedics (NAM and taping) were applied in 98% of the cases. Surgical technique included both Chang Gung cleft lip nasal repair (variant of rotation advancement techniques) and the anatomic subunit approximation repair (variant of geometric repairs). Both Tajima semi open rhinoplasty and McComb techniques were utilized in primary nasal repair. All surgeries were performed under general endotracheal anesthesia on inpatient basis, mean operative time was 120 minutes and mean hospitalization period was 36 hours. In our postoperative care we routinely apply nasal stents immediately after operation and they are kept in place using taping for the first week. Breast or bottle feeding is resumed after full recovery from anesthesia, no restriction on baby hand movements and no arm restrains. Postoperative analgesia consists of paracetamol suppositories with intraoperative local nerve block. Three doses of intravenous antibiotics are given in the peri operative period then oral antibiotic is used in the first week. All of our patients are hospitalized for overnight observation. Most of patients are discharged at the first day after operation unless there is co morbid status necessitates more stay in hospital. At discharge from hospital full family education and instructions are given, the first appointment to clinic is given after one week, we use one of the smart phone applications as synergistic tool for communication with the family with standard frontal and basal view photography images captured by the family for any help or questions. Wound care involves taping with topical antibiotic ointment for the first ten days, baby bathing is allowed at the fourth post operative day, and no suture removal is required since absorbable sutures were used in closure (vicryl 7/0 simple continuous closure which usually falls down early when scar massaging ensues). Scar care is initiated at the tenth day post operatively using silicone gel based preparations with five minutes vertical massaging not less than five times daily. In cases of vertical height nostril collapse or nostril stenosis long term silicone nasal comforters and splints of different sizes are used for six months (Fig.8). All minor revisions for secondary deformities were performed on outpatient basis. Average follow up period is two years. No exclusion criteria were set since all patients presented with cleft lip to our service were included. Fig 8: long term silicone nasal stents are used in cases of nostril collapse or stenosis. The geographic distribution of deformity was highest in the north of Jordan followed by the middle and south (48%:44%:8% respectively) (Figuer.1) and this is a very interesting finding that needs further studies of environmental and genetic factors since the population of Jordan according to the department of statistics is distributed as follows: North 27%, central 63% and south 10%.The age of the patients at the time of operation ranged between three And six months (mean age was 3.5 months). Male to female ratio was 72%:28%, ratio of CL: CLP was 52%:48%, ratio of unilateral to bilateral deformity was 80%:20%, ratio of complete to incomplete deformity was 56%:44%. In unilateral cases ratio of left to right deformity was 65%:35% (Table I). The average weight at time of surgery was 5.1 Kg and the mean operative time was 120 minutes. The most common associated congenital deformity was congenital heart disease (most common was ASD) in 25% of cases. Associated craniofacial deformities included: hypertelorism in two cases, binder syndrome in two cases, Van der Woude syndrome in one case, type 4 craniofacial cleft in one case and microtia in one case. 8% of cases had positive family history of cleft. Morbidity consisted of three cases with stich sinuses and minor dehiscence and two cases of pneumonia. There was no mortality. The most common secondary deformities were vertical nostril collapse in 23% of the patients, hypertrophic scarring in 10% of the patients, excess vermillion deformity in 5%, wide prolabium in 2% and vermilion border mismatch in 2%. ( TableII) Utilizing the Pennsylvania Lip and Nose Scoring System good results were achieved in 58% of the patients, fair results in 40% of the patients (all minor revisions were performed on outpatient basis) and poor results in 2% of the patients who required total revision. Followed by the middle and south (48%:44%:8% respectively). The incidence of cleft lip/palate differs among races, and is approximately 1:1000 in those of Caucasian descent, 1:2000 of African, and 1:500 of Asian. 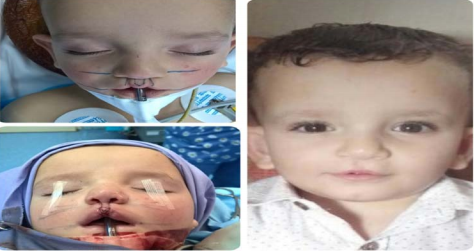 In Jordan, Al Omari F1 et al reported the overall prevalence rate for live births with cleft lip, cleft palate, or both was 1.39 per 1000 live births. Cleft teams are comprised of experienced and qualified professionals; the key for successful management of cleft lip deformity is the multidisciplinary team approach and the active cooperation between plastic surgeons, orthodontists and other team members. This centralization in cleft care from interdisciplinary and multidisciplinary care point of view leads to sufficient numbers of patients each year to maintain clinical expertise in management. 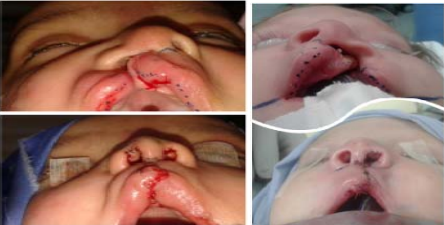 Fig 2: Pre and three years’ post operative photos of bilateral cleft lip with satisfactory result. Fig 4: nasoalveolar molding NAM. •	Accurate examination of the deformity and pre surgical planing. •	Presurgical orthodontic molding of the alveolar segments,soft tissue and nasal molding to decrese the severity of primary deformity. •	Adequate release of malpositioned ala.
•	Adequate rotation and release of abnormal orbicularis oris insertion on both sides of the cleft. •	Structural reconstruction of the nasal floor. •	Inter alar cinch stitch (using PDS 5/0 from the cleft ala to the non cleft side to control alar width) and septal anchoring suture of cephalic muscle (the abnormally released cephalic muscle is anchored to the caudal septum) for adequate advancement and to improve the overall nasolabial symmetry. •	Functional and structural reconstruction of orbicularis oris muscle with vertical or horizontal mattress sutures to create neo philtrum elevation. •	Adequate release of marginalis muscle and accurate positioning and use of Noordhoff triangular flap for vermillion reconstruction. Fig 5: results of primary cleft lip nasal repair with the Chang Gung technique. Fig 6: results of primary cleft lip nasal repair with the anatomical subunit approximation technique. Fig 7: Tajima primary semi open rhinoplasty. Fig 9: early hypertrophic scar (arrow) and pulled up lip deformity due to scarring, accurate diagnosis is essential for management, since the patient had adequate rotation and harmony immediately after operation. This cicatrical pulled up lip deformity is successfully treated with silicone sheet, massaging and pressure taping. Fig 10: white roll/vermilion border mismatch (arrows) which required minor revision with diamond shape excision and realignment. small excess vermillion deformity. Acceptable vertical height of nostrils seen from the primary rhinoplasty. Limitations to this study were the lack of national registry of cleft patients, long term follow up is needed to conclude final results about the role of primary rhinoplasty and the possible need for secondary rhinoplasty. Furthermore long term double control studies are needed to compare and evaluate the results of the rotaion-advancement versus the geometric repairs. Centralization of cleft lip care with multidisciplinary and inter disciplinary decisions between cleft team members has led to the dramatic improvement in total care. Achieving near normalcy in shape and function of cleft patient is the definitive goal with decreasing the number and complexity of subsequent procedures. 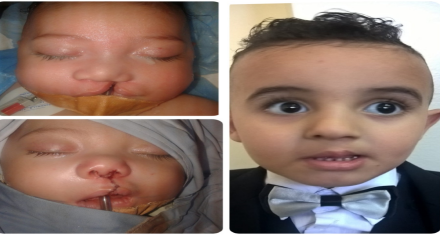 1.Al Omari F1, Al-Omari IK.Cleft lip and palate in Jordan: birth prevalence rate.Cleft Palate Craniofac J. 2004 Nov; 41(6):609-12. 2.Marcus JR1, Allori AC, Santiago PE. Principles of Cleft Lip Repair: Conventions, Commonalities, and Controversies. Plast Reconstr Surg. 2017 Mar; 139(3):764e-780e. 3.Greives MR1, Camison L, Losee JE. 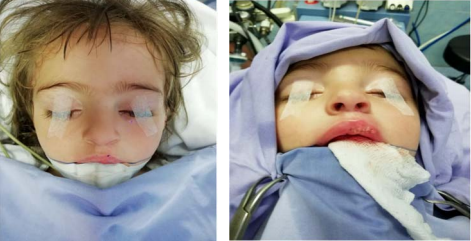 Evidence-based medicine: Unilateral cleft lip and nose repair. Plast Reconstr Surg. 2014 Dec; 134(6):1372-80. 4.Dong Wook Kim,Seung-Won Chung,Hwi-Dong Jung, and Young-Soo Jung. Prenatal ultrasonographic diagnosis of cleft lip with or without cleft palate; pitfalls and considerations. Maxillofac Plast Reconstr Surg V.37 (1); 2015 Dec.
5.Abbott MM, Meara JG. Nasoalveolar molding in cleft care: is it efficacious?. Plast Reconstr Surg. 2012 Sep;130(3):659-66. 6.Clin Plast Surg. 2014 Apr;41(2):301-9. Unilateral cleft lip repair: an anatomical subunit approximation technique. Plast Reconstr Surg. 2005 Jul;116(1):61-71. 7.Steven L. Goudy , Travis T. Tollefson. Complete Cleft Care: Cleft and Velopharyngeal Insuffiency Treatment in Children. Thieme; 1 edition (September 23, 2014). 8.Ross I. S. Zbar; John W. Canady. An Evidence-Based Approach to Secondary Cleft Lip Nasal Deformity. Plastic and Reconstructive Surgery. 127(2):905-909, FEB 2011. 10.Samuel M.D. ; Hollier, Larry M.D.24Y329. Correction of Secondary Cleft Lip Deformities. Plastic and Reconstructive Surgery: April 15th, 2002 - Volume 109 - Issue 5 - ppg 1672-1681. 11.Afifi A, Smith D, Deleyiannis FW, Jiang S, Mooney M, Vecchione L, et al. PLAN Score: Pennsylvania Lip and Nose Scoring System for Cleft Lip and Nose Deformities. Presented at the Annual Meeting American Cleft Palate-Craniofacial Association, Broomfield, Colorado, April, and the University of Pittsburgh Fourth Annual Plastic Surgery Resident Research Day, Pittsburgh, PA, May, 30. 2007.